MARQUETTE, Michigan -- A Ukrainian jet that has been sitting at a Michigan airport for nearly three years is one step closer to moving on. The Marquette County Board approved a temporary lease this week designed to help a Spanish company inspect and remove the Ilyushin IL-78 tanker jet that has been parked at Sawyer International Airport since it landed there on July 17, 2009. 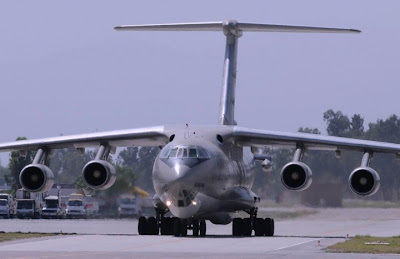 The jet was making a fueling stop at the former U.S. Air Force base during a trip from Texas to Pakistan when it was ordered held at the airport because of a legal dispute over non-payment of $63,910 for goods and services, The Mining Journal newspaper reported. Marquette County Circuit Court Judge Thomas Solka eventually awarded possession of the jet to Headlands Limited, a Spanish company that said it had a $1 million lien on the aircraft. Sawyer Operations Manager Scott Erbisch said representatives of Headlands Limited recently requested use of an aircraft hangar at Sawyer to perform a detailed inspection of the jet, which may have been damaged by the elements or by having fuel in its tanks for a long time. The plane won't be moved until the Spanish company pays $35,000 in fees for the use of the hangar, electricity and gas heat, and snow removal services needed to move the plane inside.